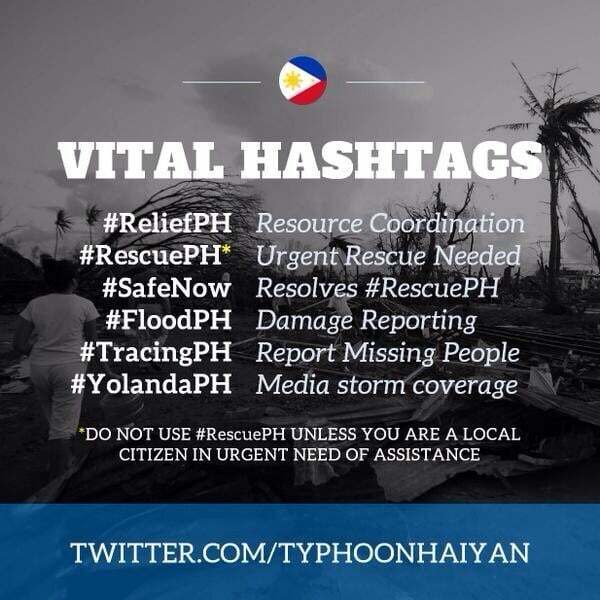 Vital Hashtags / List of Establishments Donating Profit / List of Relief Centers for Help and Rescue - All Chucked Up! 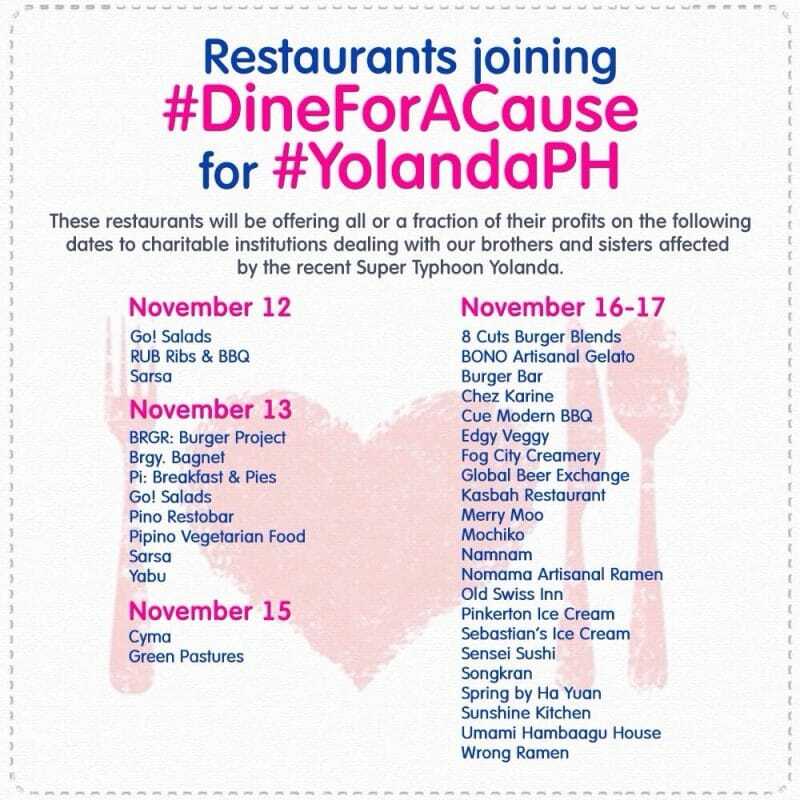 Please see the long list of places, establishments and centers that are donating and/or facilitating donations and relief for victims of Super Typhoon Yolanda. 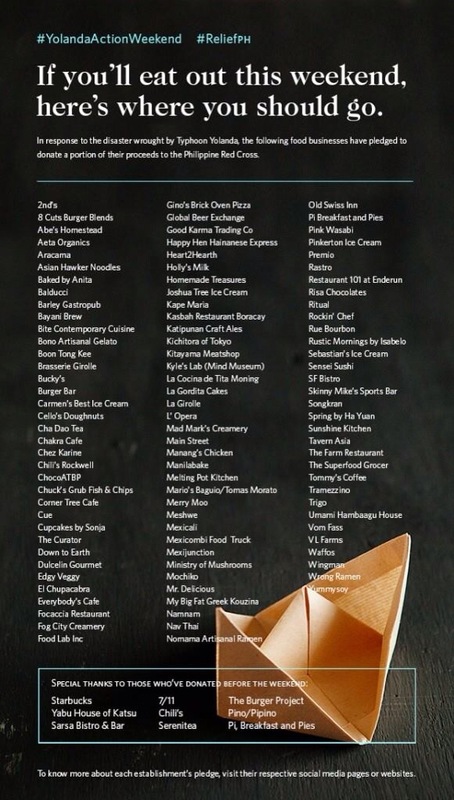 (This list is regularly updated). I encourage you to pls share this page or link to it. Also, I am sharing with everyone these VITAL HASHTAGS which we should all use to hasten relief and rescue operations for Yolanda victims and also for disseminating information to the public. 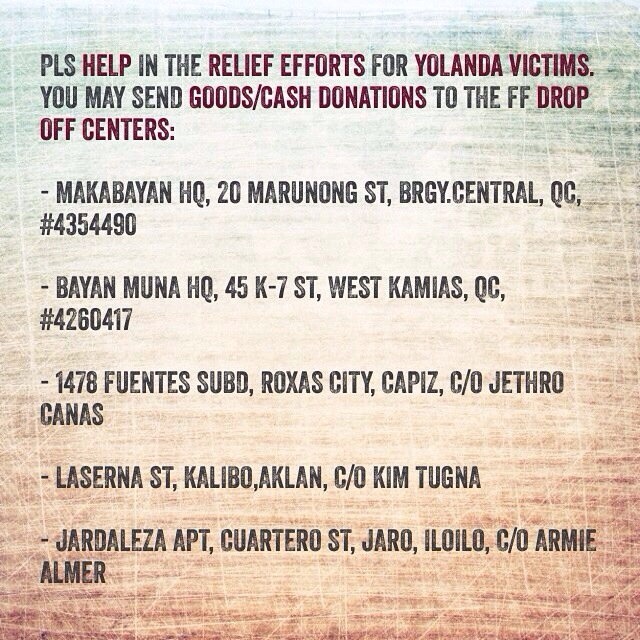 Likewise, here are a few more relief centers accepting donations of cash and in kind for all those affected by this devastating typhoon. Donors are advised to conduct due diligence before donating money directly to personal bank accounts. Ask the organization or individual receiving the deposit for an acknowledgement receipt and how they intend to spend the money. Repacking of relief goods ongoing at DSWD-NROC, Pasay City. Interested volunteers can call 8512681 to schedule. World Vision, an international Christian humanitarian, development and relief organization is accepting donations for Typhoon Yolanda survivors. 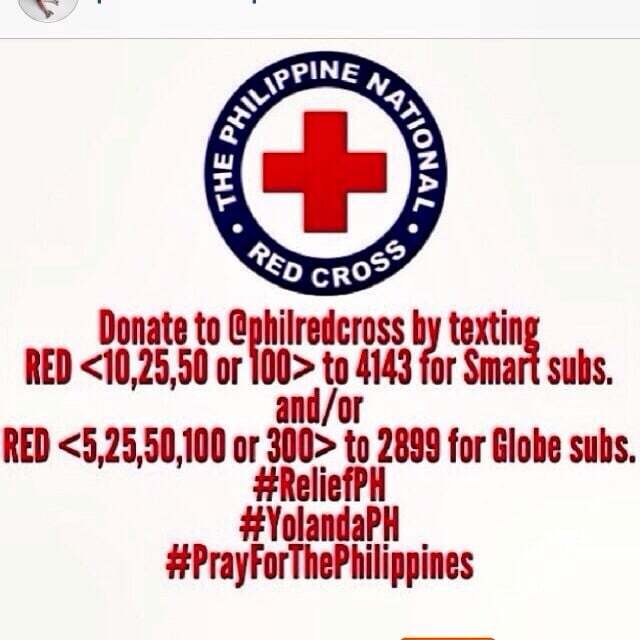 Donor hotline 372-7777 or visit their website. World Food Programme Philippines is accepting donations through their website. Cebu Provincial Government, is in need of volunteers to repack relief goods for Northern Cebu, Leyte, and Bohol. Contact Ms. Evelyn Senajon at 254-7198 and 254-8397, PSWDO, Ground Floor Executive Bldg., Cebu Provincial Capitol. The Office of Senator Bam Aquino, Extension Room 23, 5/F Senate of the Philippines, GSIS Financial Complex, Pasay City, is accepting donations Monday to Thursday from 9am – 6pm. Contact Mr. Ares Goyena at (0917)621-6311. For the Ayala Foundation’s ‘Laging Handa Fund‘, overseas donors can use this online portal for donations. De La Salle University’s Center for Social Concern and Action (COSCA) is accepting web-based donations from overseas individuals via GlobalGiving.com. Credit and debit card donations accepted. Contact Joseph Rosal, Coordinator for Community Engagement, COSCA at 525-4267 or local 147 for more information. The Catholic Relief Services is accepting donations through their website and through Caritas Filipinas Foundation. Victory is accepting online donations for Yolanda relief efforts via BPI Express Online or credit card. Save the Children is collecting donations through its online website. Save the Children has a team on the ground in Tacloban working to respond to this emergency. UNICEF is accepting online cash donations thorugh its website. Tulong Kabataan: UP System, UP Office of the Student Regent are accepting donations in cash or kind. Dropoff point: Vinzon’s Hall, UP Diliman, Quezon City. Contact Eds (0927)384-1392 or Zie (0916)796-5740) for more information. Tulong Tomasino of the UST Simbahayan Community Development Office in Manila is accepting donations. Tweet @USTCSC. Center for Social Action and Concern (COSCA) De La Salle University Manila, food and non food donations can be droped off at the COSCA Office 2nd Floor, Br Connon Hall. Contact Joseph Rosal at (0922) 899-2558 for inquiries. Ateneo De Manila Disaster Response and Management Team is accepting cash donations. Check this page on how to donate. For inquiries contact the Office of the Vice President for Social Development at (632) 4266001 locals 4051, 4054, 4099. Dakila’s Ride and Rock Relief is calling on artists, cyclicts, donors, and individuals willing to donate their talent, time, and relief goods on November 10, 9am to 4pm at My Little Arts Place, 222 Wilson St., San Juan City, Metro Manila. For inquiries call 435-4309. Operation Blessing Philippines is accepting donations in cash and kind at E. Rodriguez Ave. C5 Road cor. Corporal Cruz Bagong Ilog, Pasig City. Call 477-7802 to 04 or (0917)581-2603 for more details. 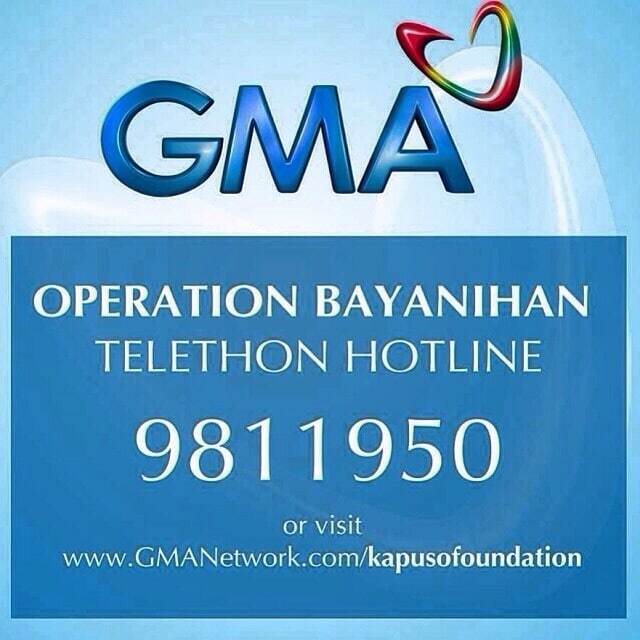 Operation Blessing is also accepting volunteers for their partners in Cebu and other nearby areas. De La Salle Santiago Zobel through its Social Action Office (SAO) now accepts donations for the affected communities in the recent Typhoon Yolanda. Kindly bring all donations to Gate 2, 3, and 7 of the campus. For inquiries, contact Mr. Jayjay Jacinto at 0917-8597602 or Ms. Evangeline De Peralta at 0917-5638870. Send a scanned copy of the deposit slip to [email protected] or [email protected] for proper acknowledgment. Citizen’s Disaster Response Center is calling for donations and volunteer’s at 72-A Times St., West Triangle Homes, Quezon City. Call 929-9820 for inquiries. The Mu Sigma Phi Relief Operations of the UP College of Medicine s now again accepting donations for victims of Typhoon Yolanda. Eman (0925-884-3050) or Billy (0927-571-1017/0922-535-6100). St. Michael’s Church at The Fort is accepting donations through Father Arnold. Water and food are badly needed. The church addesss is at 39th Street, North Bonifacio Triangle, Bonifacio Global City. DLSZ through its Social Action Office (SAO) now accepts donations for the affected communities in the recent Typhoon Yolanda. Kindly bring all donations to Gate 2, 3, and 7. ETYSBM Student Council of Mapua Institute of Technology is now accepting relief goods at 333 333 Gil Puyat Ave, Makati City. Contact Angeline Bernardino (0915)446-9715 or Edgar Aquino (0905)149-2319 for more information. Santuario de San Anotio Church at 3117 McKinley Road, Forbes Park, Makati will be accepting on November 10 at 9am at the Parish Center. The goods will have to be packed in Manila for immediate distribution in Tacloban and other affected areas. Call (632) 843-8830 to 31 for more details. Give a Drop of Love, CFC Foundation, Inc. WWP at Apartelle 12, Starmall Complex, EDSA cor. Shaw Blvd., Madaluyong City are accepting food/non-food donations. 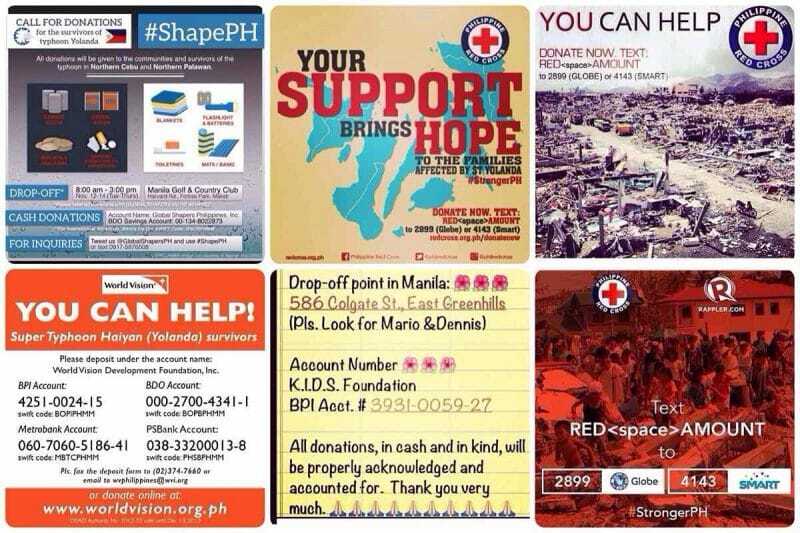 For cash donations: CFCFI BPI Mandaluyong Branch, Dollar: 0184-0279-84 or Peso: 0181-0504-89. Fax your deposit slip to (+632) 718-2213. Contact Anna Arcaya at 718-2213 or (0923)583-8577 for more details. Lingap Gabriella Manila, drop off relief goods, medicines, and cash donations at 35 Scout Delgado St., Brgy. Laging Handa / 25 K-10th Street, West Kamias, Quezon City. Contact 374-3451 for more details or tweet @gabrielaphils. Operation Walang Iwanan of UP Gawad Kalinga – Los Baños & UPLB USC are accepting donations of relief packages and cash. Contact Cyril (0926)341-9140 or Rohanne (0915)449-0589 for inquiries. Ramon Aboitiz Foundation, Inc. is accepting donations in cash or kind at 35 Lopez Jaena Street, Cebu City. Contact Edwin Marfil (local 510) or Totits Ocampo (local 204) at (032) 418-7234 for inquiries. Lingap Gabriella Bohol, drop off relief goods, medicines, and cash donations at FARDEC Office, Lower Butalid St. Tagbiliran City. Contact (0912)5949170 for more details or tweet @gabrielaphils. Operation Yolanda, University of St. La Salle Bacolod, is accepting donations in cash or kind. Drop off point is 2nd Gate Security Office, Center for External Relations, Institute for Negros Development. Account Name: Gawad Kalinga Community Development Foundation Inc.
Liceo Ripple of Hope of the Liceo de Cagayan University is accepting cash donations at the R.N. Pelaez Boulevard, Carmen, Cagayan de Oro City from November 11 to 15. Cash collected will then be deposited to ABSCBN’s Sagip Kapamilya account. Contact +63 (088) 858 4093 to 95 local 231 or +63 917 716 1613 for more details. Pls share this page. If you are aware of other relief centers accepting donations of any kind, pls leave them on the comments section below. It is vital to get important information out immediately. God bless your generosity and help. 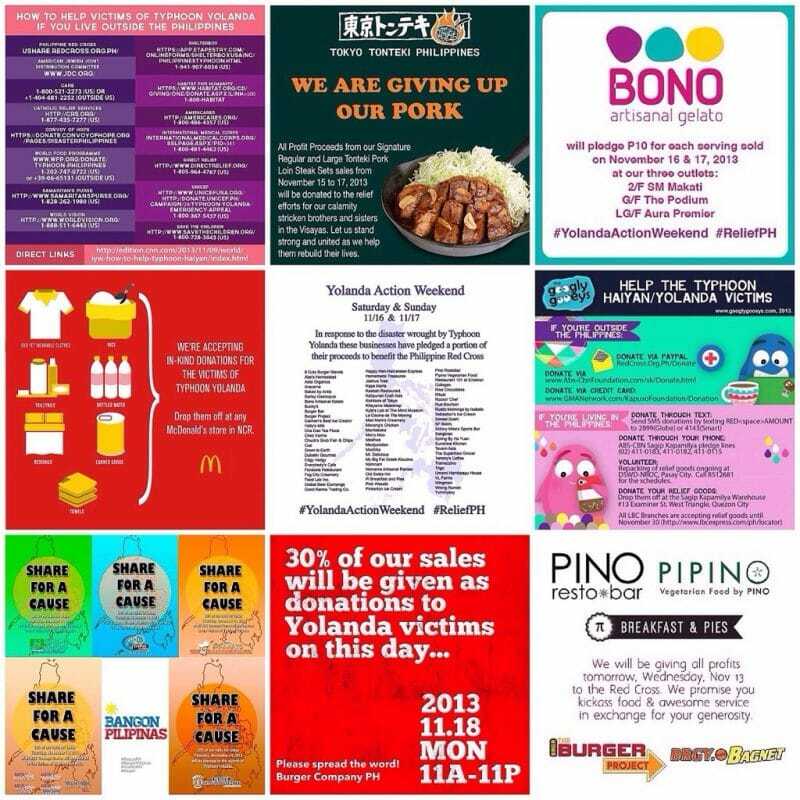 Ways to help typhoon Yolanda survivors | Mabuhay DIY!